The main road (A84) leaves Callander for the north by the Pass of Leny. It then follows the windings of Loch Lubnaig, before reaching Strathyre. 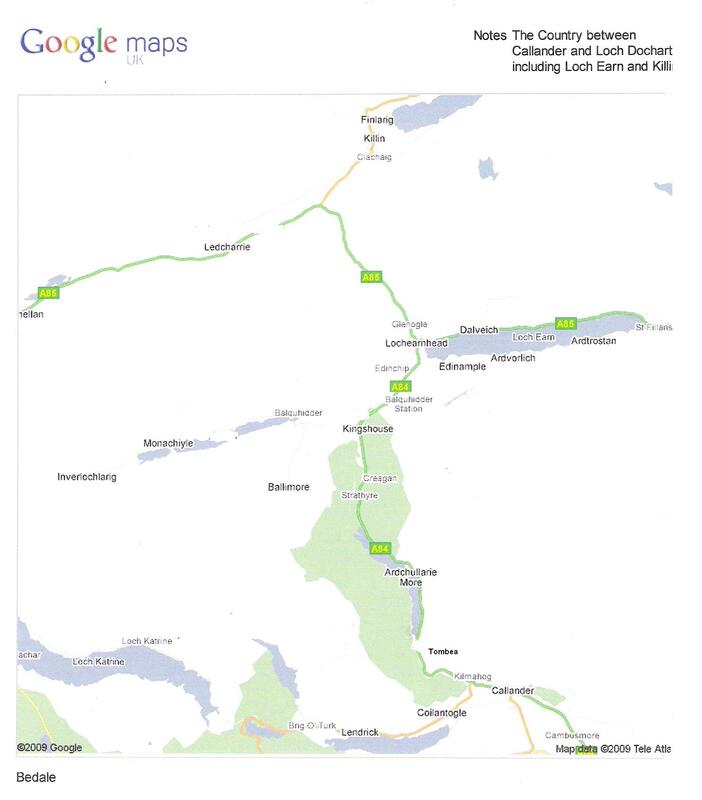 Further on, at King’s House, a by-road (a dead end) leads to the village of Balquhidder and the Braes of Balquhidder. The A84 then climbs northwards across a low pass to reach a junction with the A85 at Lochearnhead. From there a circuit of Loch Earn may be undertaken. Beyond Lochearnhead the road ascends Glen Ogle, and then descends to Lix Toll, the junction for Killin. The road from Callander to the north follows the line of the old military road, which links Stirling with Fort William. It was begun in 1748 by Major William Caulfield, and completed in 1761. The former Callander and Oban railway line, which provides an alternative route for walkers and cyclists, follows the other side of Loch Lubnaig. You ascend a steep path, birch trees on the right and left; the stream comes brawling down, sleeping for a moment in black pools beloved by anglers then hastening on in foam and fury to meet her sister in the Vale of Menteith below. The bracken curtain for my head. And all it promised me Mary! His foot like arrow free Mary! Shall be a thought on thee Mary! To my young bride and me, Mary! The foundations of this ancient Chapel of St Bride were identified and restored in his centenary year of 1932 in memory of Sir Walter Scott whose romantic genius still sheds ornament on this countryside. The township of Tombea, of which there is now little trace, was east of the Chapel on the old road. 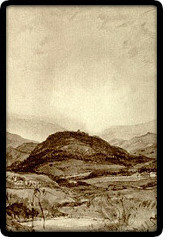 It was the birthplace of Alexander Campbell (1764-1824), perhaps the most considerable locally born artist, musician and poet, whose Journey from Edinburgh through parts of North Britain of 1802 and 1811 was highly influential in bringing early C19 visitors to the Trossachs before the publication of The Lady of the Lake. Campbell was a pupil of, the celebrated counter tenor Tenducci, and the tutor of the rather unmusical Walter Scott. He was also the editor of Albyn’s Anthology; or, A select collection of the melodies, songs, dancing measures, and military music peculiar to…Scotland and the Isles.. It was published in two folio volumes, by Oliver & Boyd in 1816 and 1818. The most enduring song in it is Macgregor’s Gathering, composed by Scott. A prospectus, written by Scott, one of Campbell’s supporters, appeared in 1816. However, the miscellaneous author was never quite talented enough to be successful, and was always an impoverished figure. Their course had lain for some time along the banks of a lake, whose deep waters reflected the crimson beams of the western sun. The broken path which they pursued with some difficulty, was in some places shaded by ancient birches and oak-trees, and in others overhung by fragments of huge rock Elsewhere, the hill, which formed the northern side of this beautiful sheet of water, arose in steep, but less precipitous acclivity, and was arrayed in heath of the darkest purple. In the present times, a scene so romantic would have been judged to possess the highest charms for the traveller; but those who journey in days of doubt and dread, pay little attention to picturesque scenery. The master kept, as often as the wood permitted, abreast of one or both of his domestics, and seemed earnestly to converse with them, probably because the distinctions of rank are readily set aside among those who are made to be sharers of common danger. The dispositions of the leading men who inhabit this wild country, and the probability of their taking part in the political convulsions that were soon expected, were the subjects of their conversation. Johnson had translated an account of some early travels in Ethiopia and later written a novel, Rasselas, set in the same country. Bruce’s descriptions did not accord with Johnson’s imagination, so Johnson belittled Bruce, and Boswell followed suit. Poor Bruce was known at one time as the ‘travel-liar’. However, posterity has given him his due as one of the more significant African explorers. But, ah! it vanished from my view! His father, Colonel John MacGregor (1847-1932), was a notable Gaelic poet, and became Bard of the MacGregors. He is actually buried in Balquhidder. The fame of Balquhidder does not owe everything to the Macgregors since the renowned Reverend Robert Kirk (1644-1692) was the Minister there. On 8th November 1664 he became minister of Balquhidder and on 9th June, 1685 was appointed to his father’s old charge at Aberfoyle. Kirk was twice married. He married Isobel Campbell in 1678, and the couple had one son, Colin. However, Isobel died two years later, on Christmas Day, and her gravestone, with an epitaph cut by her husband is situated at the western end of the graveyard. Unfortunately the inscription can no longer be read. Whilst at Balquhidder, Kirk began work on the transliteration of the Bible, the Psalms and the Catechism into Highland Gaelic, and wrote a helpful vocabulary (in effect the first Gaelic dictionary). He also created a metrical Psalter, published in 1684. This work was the first-ever complete translation of the psalms for Gaelic speakers. It was reckoned to be both important and elegant, displaying a great deal of literary talent as well as skill. He also began gathering material in Balquhidder for his book about fairies, The Secret Commonwealth (see Aberfoyle). In Victorian times the Free Church Minister of Balquhidder was Eric John Findlater (1813–1886), who married Sarah Laurie Borthwick (1823–1907). She had collaborated with her sister Jane in translating hymns from the German. In her husband’s parish Sarah inaugurated a library, ‘as a diversion from what she considered the excessive drinking habits of the residents.’ [ODNB]. Two of their three daughters, Mary and Jane, later wrote successful novels (see below). On the braes o’ Balquither. Mang the braes o’ Balquhidder. Opposite the church is Glenbuckie. There and elsewhere in the district there were prominent supporters of the Jacobite risings. It was at Glenbuckie that Murray of Broughton sheltered with the Stewarts during his flight from Culloden. James Stewart of Ardsheil, Stevenson’s ‘James Stewart of the Glen’, also stayed there in 1752, and was visited by ‘real’ Alan Breck. Famously, Stewart of Glenbuckie also sheltered Dr Archibald Cameron in the following year when the Elibank plot was afoot. Glengarry betrayed the plot, and let the Hanoverians know what Cameron was doing in the Highlands. However, Calum Maclean (1915-1960), the eminent folklorist, states that Cameron was discovered because his presence was suspected when a child, who was ill, made a surprising recovery and a jealous rival reported him. Other sources state that a kinsman betrayed him; yet others implicate James Mor MacGregor, Rob Roy’s son. 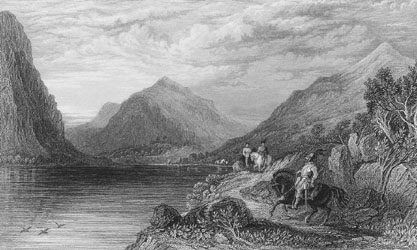 There is an account of Cameron’s arrest by soldiers from Inversnaid in the National Archives, but whether it took place at Glenbuckie or at Brenachoil on Loch Katrineside is also in dispute. Doctor Archibald Cameron, brother of the celebrated Donald Cameron of Lochiel, attainted for the rebellion of 1745, was found by a party of soldiers lurking with a comrade in the wilds of Loch Katrine five or six years after the battle of Culloden, and was there seized. 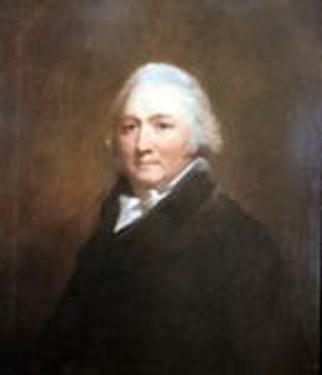 There were circumstances in his case, so far as was made known to the public, which attracted much compassion, and gave to the judicial proceedings against him an appearance of cold-blooded revenge on the part of government; and the following argument of a zealous Jacobite in his favour, was received as conclusive by Dr. Johnson and other persons who might pretend to impartiality. Dr. Cameron had never borne arms, although engaged in the Rebellion, but used his medical skill for the service, indifferently, of the wounded of both parties. His return to Scotland was ascribed exclusively to family affairs. His behaviour at the bar was decent, firm, and respectful. From the foot of Loch Voil there is a charming road beside Loch Voil and Loch Doine, leading to a car park at the head of the glen. The road follows the line of an early military road, which linked Inversnaid and Ruthven Barracks in Inverness-shire. Invernenty is the site of a farmstead, rebuilt in 1746, which is situated across the river from the car park. It belonged to the MacLarens, and is now ruined, but it has important literary associations. It is opposite Inverlochlarig, site of Rob Roy’s last home, where he died in 1734, and it is probably the place, which Robert Louis Stevenson had in mind where David Balfour rests up in Kidnapped, and Alan Breck and Robin Oig have their renowned ‘piping contest’. It was a Maclaren of Invernenty who gave Scott the idea for the incident in Redgauntlet when a clansman wraps himself in his plaid and rolls down the hillside at the Devil’s Beef Tub. I have long since learned to admire the simple, native music of my country with all the fond enthusiasm of ignorance: And as I have not the happiness to understand Gaelic, it was natural for me to be pleased with the words of a Gaelic song. . . It is a fact in the history of the manners of the Highlanders, that they are accustomed to sing at the performance of almost every piece of social labour: Rowers in a boat sing as they ply the oars; reapers sing as they cut down handful after handful of the corn; and here were washers singing as they rubbed and rinsed their clothes. This accompaniment of music certainly renders the labour more cheerful. From the head of the glen it is necessary to retrace one’s steps to the A84. At the main road is another reminder of the military road, the King’s House. The hotel was built in 1779. 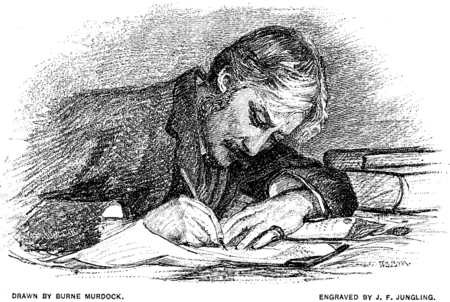 In 1882 Robert Louis Stevenson also stayed at the inn with his father. Here he began to collect material for Kidnapped in earnest. RLS was the basis for the successful character, Lorin Weir, in Penny Moneypenny  by the sisters Jane Helen (1866–1946) and Mary Williamina (1865–1963) Findlater. Mary, possibly descended from a laird on the wrong side of the blanket, was born in the Manse (now the Mansewood Hotel) at Lochearnhead, and although, after their father’s death, they moved to Prestonpans, to England and eventually to Comrie, their early life was significant in their work. They wrote highly successful romantic novels separately, in collaboration, and with other writers between 1896 and the twenties. Their successful book Crossriggs  has been re-published as a Virago Classic. 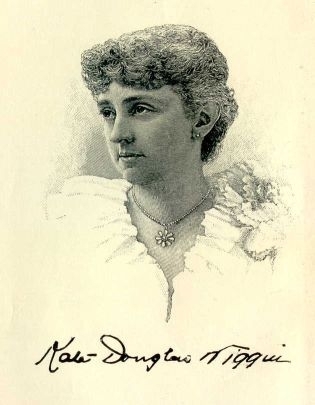 They wrote two books with Charlotte Stewart of Ardvorlich (see below) and Kate Douglas Wiggin (1856-1923), the American author of Rebecca of Sunnybrook Farm. These two novels were The Affair at the Inn  and Robinetta . Like their other books they were popular at the time in both Britain and the United States. For McDiarmid this passage is fairly coherent, but he exuberantly carries on until, beside the Falls of Beich Burn, he is virtually incomprehensible. Enthusiasts can find him on Google Books. In the heart of Glen Gonan ..
Quite what the connection beween Bottomley and Loch Earn was is not clear; he was born in Yorkshire and lived in north Lancashire. 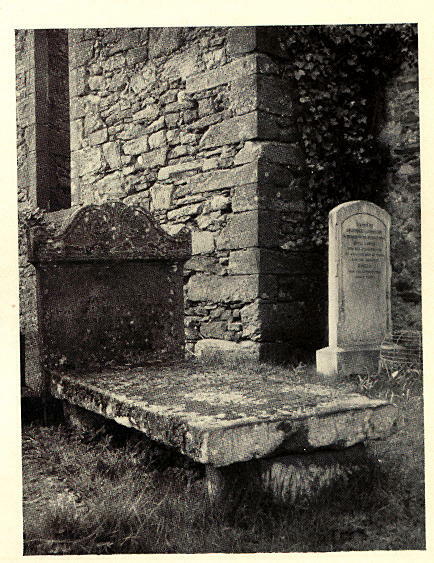 He and his wife died in Wiltshire, but their ashes are scattered in the Chapel of Saint Fillan under Dundurn, where there is a memorial gravestone. Where danced the moon on Monan’s rill. The broad-leaved or wych elm (Ulmus montana), indigenous to Scotland. Forked branches of the tree were used in olden time as divining-rods, and riding switches from it were supposed to insure good luck on a journey. In the closing stanzas of the poem it is called the “wizard” elm. An’ ilka collie’s bark is his. The Warld is a’ the Markiss’s. Archie McKerracher, the local historian showed that this poem is a reworking of an older verse dating from the evictions. Duncan Ban MacIntyre [Donnchadh Bàn Mac an t¬-Saoir] (1723? –1812), Scotland’s most renowned Gaelic poet, is particularly associated with Argyll, but he spent more than twenty years (1744-66) working as a forester on the Breadalbane estate in Glen Lochay, in Perthshire. The subject of one of his most famous poems, The Misty Corrie, is in upper Glen Lochay. We can also suppose that the mock sporting estate, ‘Crummie Toddie’, in Anthony Trollope (1815-1882) The Duke’s Children  was located in Breadalbane. He associates it with ‘The Callander and Fort Augustus Railway’. If it isn’t, it ought to be.